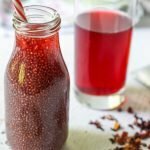 This low carb fruit7 chia tea is a healthy and tasty drink you can easily make at home instead of buying an expensive one at the store. Using fruity herbal tea you can make any variety of flavors you wish! Add chia seeds to cup of water. Mix well and refrigerate for 1 hour. Mix chia mixture with 2 cups of brewed tea. Mix well and refrigerate for another hour and it's ready to go!